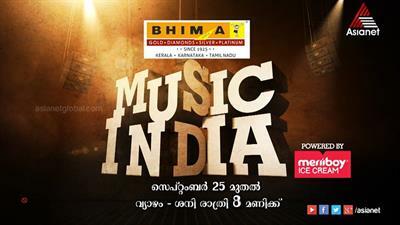 Watch the latest/ today's episodes of Bhima Jewels Music India reality show on Asianet, an innovative programme to find the best music bands in the state. The reality show which has already grabbed the attention of the viewers will be aired on Asianet on Thursday, Friday and Saturday from 8 pm to 9 pm. Ranjini Haridas will anchor the show while Shivamani, Andrea Germiah, Gopi Sunder, George Peter and Deepak Dev will be the judges for the competition with 12 teams contesting for the title. After the grand success of Star Singer Season 7, Asianet is ready to impress the audience with yet another innovative programme. Titled 'Music India', the show touted to be the first reality show for the music bands in the state will bring the best 12 teams on a single platform. Selected bands will compete at various levels which would deliver a visual and musical treat for all generation TV viewers. The reality show which has already grabbed the attention of the viewers will be aired on Asianet on Thursday, Friday and Saturday from 8 pm to 9 pm. Ranjini Haridas will anchor the show while Andrea Germiah, Gopi Sunder, George Peter and Deepak Dev will be the judges for the competition with 12 teams contesting for the title. This music reality show was launched on 25th September with Remya Nambeeshan & Sivamani being invited as a celebrity guests. The teams have been selected through a wide audition conducted in in all major cities in Kerala and abroad. Apart from the jury members, prominent personalities from the malayaalm film industry will attend as celebrity guest during the show. The major sponsor of this reality show is Bhima Jewels. 'Music India' would give a unique platform for the budding and amateur music bands to show their talents and perform before the huge audience. Each team which comes with innovative names is having a bunch of young talents who are specialized in singing and handling various instruments. The first episode unboxed with a surprise not much seen in the history of malayalam television history. More than an innovative approach in setting the stage, the concept too is different. The show is being packed in such a way to meet International standard. So get ready to enjoy hours of unlimited music with the best bands. Sharpen your ears to hear some interesting music treat offered by the budding talents in the state.